Fits 1999-2018 GM Trucks and SUV's with factory flat panel style filter. Introducing our new line of Delta Force panel air filters. This is a great and economical way to add some extra performance and filtering protection for your 1999-2018 GM trucks and SUV's with V6 and V8 gas engines. These premium quality air filters are designed as a direct replacement to fit snugly in the factory airbox thanks to the durable black urethane outer frame/seal. The high flow red woven cotton gauze filtration media comes pre-oiled and is ready to drop-in out of the box for a quick an easy installation. 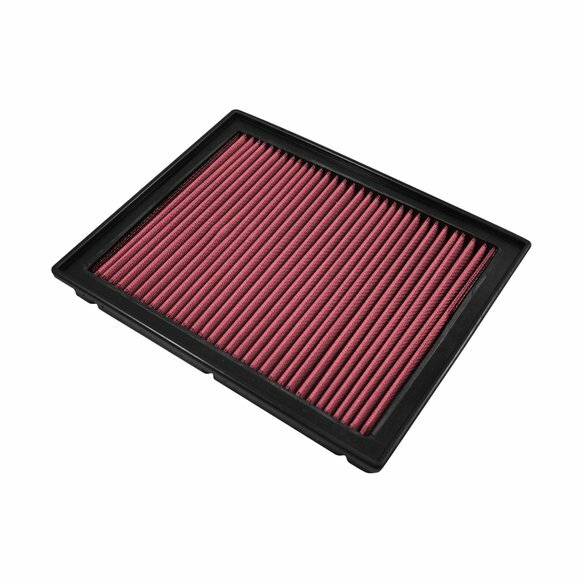 Another bonus is the filters are serviceable with our Delta Force Performance Filter Refresh kit part #615001 and with a proper maintenance schedule, should be the last air filter you buy for your vehicle.